Scientific name: Averrhoa carambola. The genus Averrhoa includes two well-known sorrels (Oxalidaceae) family of fruiting trees, carambola, and bilimbi (tree cucumber). The fruit is recognized as belimbing manis or balimbing (filipino) in many South-East Asian regions and kamrakh in India. Averrhoa carambola tree with fresh fruits. Photo courtesy: konaboys. Starfruit. Photo courtesy:scottzona. Carambola fruit features light-green to yellow with attractive smooth waxy surface and weighs about 70-130g. Inside, it's crispy, and juicy pulp can either be mildly sweet or extremely sour depending upon the cultivar type and amount of oxalic acid concentration. In some seed varieties, 2-5 tiny edible seeds found at the center of each angled cavity. Star fruit is one of the very low-calorie exotic fruits. 100 g fruit just provides 31 calories, which is much lower than for any other popular tropical fruits. Nonetheless, it has an impressive list of essential nutrients, antioxidants, and vitamins required for well-being. The fruit along with its waxy peel provides a good amount of dietary fiber. Fiber helps prevent absorption of dietary LDL-cholesterol in the gut. The dietary fibers also help protect the mucous membrane of the colon from exposure to toxic substances by binding to cancer-causing chemicals in the colon. Starfruit and its juice are often recommended in many folk medicines in Brazil as a diuretic (to increase urine output), expectorant, and to suppress a cough. (Medical disclaimer). 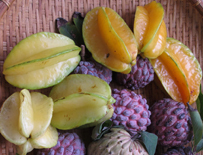 Fresh star fruits can be available twice in a season. In Florida, for example, Arkin cultivars are available from December to March. In general, fruits just short of ripening stage are picked up for shipment and storage; since the ripe fruits tend to bruise easily, especially their thin ribbed edges. While buying, choose uniform, large, attractive looking, yellow-orange fruits. Avoid green, small size fruits since they tend to be extremely acidic, and unappetizing. Avoid those with cuts, bruised, shriveled or spots. Averrhoa carambola tree with fruits. Photo courtesy: Jorge Brazil. Star fruits and custard apples in a market. Ripe fruits tend to perish early; however, they stay well in cold storages when kept at appropriate temperatures. At home, unripe light green fruits may be stored at room temperature until they turn vibrant orange-yellow color. Ripe fruits may keep well for 2-3 days at room temperature, but required to be stored in the refrigerator for extended shelf life. 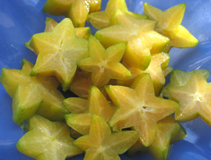 Star fruits are generally used as a garnish in salads, sorbets, drinks, as well as to impart tart flavor in dishes. Given their high oxalic acid content and extreme tartness, they used quite less frequently in food the industry. To prepare, wash them thoroughly in cold water, dry mop using absorbent cloth. Trim off the ends and edges of the ribbed angles. Cut the fruit crossway into thin sections, which resemble like a starfish. Pick out any seeds located near its center. 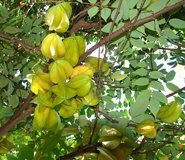 Only sweet-variety Carambola can be eaten fresh or mixed with other fruits in salads. Fresh fruit can also be juiced and used in cocktails with other complementing tropical fruit juices. Sour type fruits are favored in cooking as they impart unique tart flavor to poultry, meat, and seafood dishes. Cut sections of fresh fruit added to stews, curries, and stir-fries with chicken, and fish and shrimp. The fruit can be used to make sauce, pickle, chutney, tarts, and jam. Star fruit is one of the plant sources that contain the highest concentration of oxalic acid; 100 g of fresh fruit contains 50,000-95,800 ppm of oxalic acid. Oxalic acid has been considered as anti-nutrient compound as it interferes with absorption and metabolism of several natural minerals such as calcium, magnesium, etc. It also predisposes to a condition known as oxaluria, a condition which may lead to the formation of oxalate kidney stones. In some people with impaired kidney function, its consumption would result in renal failure and may cause death. Individuals with known kidney disease should, therefore, encouraged to avoid eating star fruit. Further, Star fruit, like grapefruit, has been found to interact adversely with many drugs. Some of the compounds in carambola irreversibly inhibit cytochrome P450 3A4 isoenzymes (3A4) in the intestines and liver. This resulting increase in drug levels leads to adverse effects and toxicity. It is, therefore, strongly advised to consult your healthcare practitioner before eating star fruit or its products if taking any pharmaceutical drugs. <<-Back to Fruits from Star fruit. Visit here for an impressive list of all variety of fruits with complete illustrations of their nutrition facts and health benefits.